Being a custom door and window manufacturer means Euroclad can pretty much design any door you can dream up. Whether you’re looking for a metal door, fiberglass door, or a full wooden door, we can build it all. A big part of your custom door build is the hardware you choose to attach to the door. We’ve talked a bit about this in our article How to Create a Custom Door for Your Home. However, we didn’t talk about the locking mechanism specifically. Door locks come in many varieties. From a traditional deadbolt, to a key-less entry with a keypad. But is it better to have the keypad as part of the door latch system? Or does it make more sense for the deadbolt to be separate? Here are 5 things you need to know about door locks. First of all, the security failure point of a door is almost never the lock or the door. The biggest failure point is usually the door jamb. When a door’s security is compromised, it’s likely going to happen with the wooden structure around the door, and not the door itself. 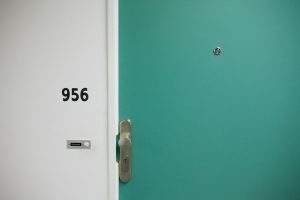 We’ve talked a lot about the strength of fiberglass, metal and wooden doors, and even less expensive doors are unlikely to fail before the door jamb. The same is true for hardware. When you inspect a solid locking mechanism for a door, they’re usually made of thick metal, which is unlikely to fail before the wood and thin metal of the nails and screws in the door jamb. Jamb failure is why a quality installation matters. How a door is installed will make a big difference in how quickly it’s compromised. A quick installation by an unqualified contractor can leave many weak points around the latch, deadbolt or hinges. You’ve probably seen a sketchy New York apartment in the movies where the door has five locks, but does that really improve security? It really depends. Most of the time locks are more about being a deterrent than turning your home into a rock-solid safe. Assuming your door isn’t going to fail right away at the jamb, the thief is likely looking at picking a lock. The more locks you have, the harder the job. Realistically, there aren’t many burglars that are willing to hang out at your front door for hours trying to get in. They may try a window, or patio door if the front door is well built. In all likelihood, one lock is more than enough. Smart locks that can be unlocked via the internet, Bluetooth or RFID are generally more about convenience than safety, as these locks are not necessarily better built. For example, apartment buildings often use some form of RFID tag to buzz yourself in the building, but this is more about controlling access. The actual hardware lock isn’t much different from a traditional key mechanism. If you want the convenience of a smart lock, they’re great, but just don’t expect it to be any more secure than a traditional deadbolt. You’ll want to inspect your lock hardware from time to time to make sure it’s still in great working order. Most of the time, hardware is replaced because the owner wants a new look. Quite often the installation will need repair before the lock will. You’ll want to watch for loose screws, bent or loose pieces (often from accidentally closing a door while the lock was engaged) and covers that shift due to coming loose. Most often just tightening up the screws will solve any issues. 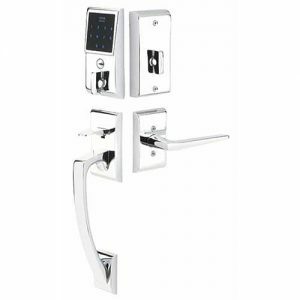 If you are in the market for some new great looking hardware, we have a huge selection of door hardware and locking systems available for you to browse.